Daisy by Marc Jacobs is a floral and woody fragrance for women. This is a powdery scent that opens up with dazzling notes of blood grapefruit and strawberry, followed by a bouquet of jasmine, gardenia and violet on a comfortable base of musk, white woods and vanilla. Daisy is a clean and innocent scent that will freshen up your day. It comes in the iconic daisy-shaped bottle, which will be a classy addition to your perfume collection! Daisy's instant freshness makes it a great fragrance for everyday use, as well as to give you an extra boost of energy. Due to its extraordinary success among women of all ages, Daisy has been followed by many other editions, including Daisy Blush and Daisy Kiss. Daisy was launched by Marc Jacobs in 2007. 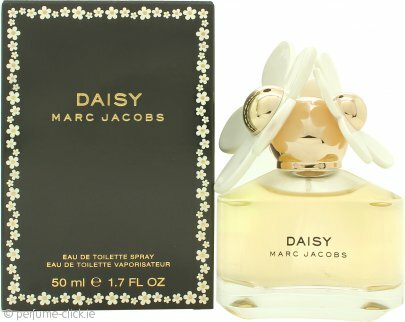 Marc Jacobs Daisy Eau de Toilette 100ml SprayGreat scent for a Great price!! My favourite perfume! Amazing scent. All Marc Jacobs perfume is lovely! Would highly recommend this perfume to try. These prices are amazing as well. NOTE: If you select a recorded delivery option you will be required to sign for the delivery. We endevour to despatch our item within 24 hours of receipt of order; for orders placed over the weekend and on bank holidays will be despatched on the next working day.